On reflecting on my previous piece “The year’s most punchable faces of 2014” I was faced with stark contradiction . As the post on Facebook I added before this article was a meme on compassion here on the left. 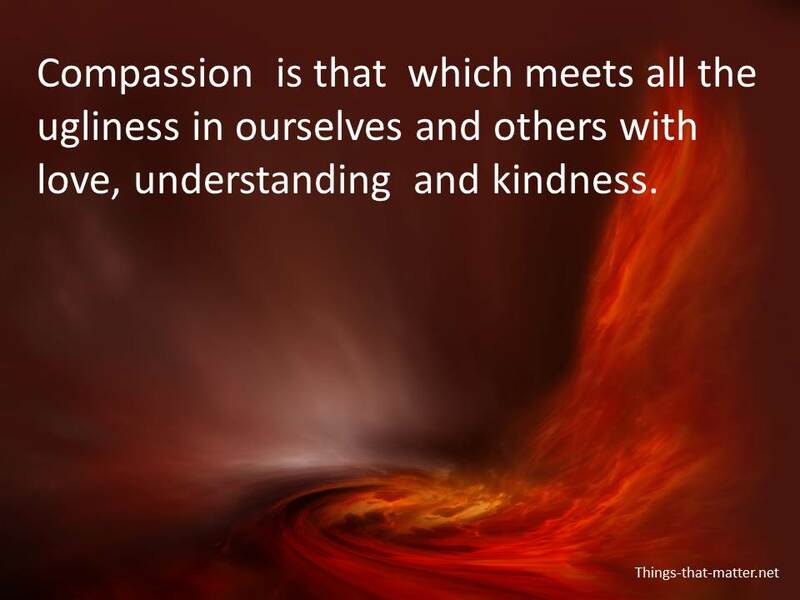 Its definition I had actually come up with myself, after one of my daughters asked me what compassion was, “comfashion” as she worded it. The answer I arrived at that best described what compassion meant to me was “That which meets all our ugliness and the ugliness of others with love, kindness and understanding.” That being the case I think it makes compassion such tremendous virtue, as it’s inclusive of all the pain and wrong doings that go on, as well as the love and hope. Yet there I was following this up by posting an article about who was most deserving of getting punched in the face for 2014. A friend on Facebook, who is normally quite positive about what I write, said she thought that particular piece was in “bad taste.” I kind of fob it off thinking she needed to get a sense of humour. Then two nights ago I posted the article on the message board of Medialens.org and the following morning it was a delated , despite its tongue cheek tone it was deemed inappropriate , a polite way of saying again in “bad taste”. So faced with that I could either get defensive and start accusing the whole world of not having a sense of humour or take it in, be humble and reflect on why it could be seen as offense and what did I write that left a taste of “bad”. Also is posting one thing about compassion and then an other about face punching does that make was me hypocrite? I don’t feel it hypocritical, rather its reflection of the complicated and conflicting feelings we have at times. When I wrote it I had no intention of encouraging people to actually punch these people in the face. The term “he has punchable face” is now common phrase to describe a certain kind of smugness that invokes that wanting to punch them in face type feeling. Of course I wrote it as a humour piece but if I am honest there is part of me that feels a kind of angry and hostility towards some of those on my list. Rereading it there is contain within the humour a kind of hostility and aggression, like the maxim says “Many a truth said in jest”.Maybe It is this which left the bad taste. As It does genuinely rile me how brazen and shameless the ruling elite are regarding the suffering they dish out to others and the advancement of their own interests. This disregard for people and the environment that our political class hold, seems unrelenting; their actions seem to getting bolder and more brazen, in the face of this it’s hard not to feel anything but anger. Not so much, given the chance I would actually punch any of these people in the face, but it has the seed of how they could come about. Then addition to this is the apathy and docility that the general public seems to have about these critical issues. As I was commenting the other day on Facebook about the correlation between the widening of income equality and media concentration over the last 40 years. It seems the general public have been gradually sedated into compliant passivity. So that pisses me off as well. So I guess some of anger leaked into that post in an unaware kind of way, which doesn’t truly reflect what I feel deep down. As running parallel to that anger is an awareness that it’s that very anger and contempt, is the birth place of all the violence I consciously abhor. That feeling of self-righteous condemnation of “other” be that other Tony Blair, is no different to Tony Blair’s self-righteous condemnation of other. There aren’t many despots who see themselves as despots, they all cloak themselves in the illusions that shield them from the ugliness which they have become.Most of us do the same. Yet my anger has place, maybe not on public blog and maybe express a little more subtlety but has a function. At the same time I know it not my anger, or the collective anger of the citizenry that will bring about the radical change that seems to be required for humanity to continue. How many times do see well-meaning revolutionaries transform into the very thing they have toppled. All because they are acting within the same paradigm , just different sides of the coin. If we expect a real change in society as whole it must come from a different place and I see a starting point for that being the development and nurturing of compassion. To contribute to wider social change the most essential act I can take is resonate and act in accordance with compassion. Not just for those I deem worthy, such as the suffering Palestinians but also for the Israel’s political elite who are instigator of their misery. Compassion doesn’t pick and choose, its very nature is an all-encompassing, inclusive of all the good and bad, in me and in the world. At heart it’s the true meaning of Jesus asking us to “Love thy Enemy .” To love everything you are not and everything you despise. Yet that act and choice of compassion is not easy, when it taken beyond the actually sentiment and is genuinely integrate into how you think and feel. As there so many unconscious and crude forces at work, it is very easy just to go along with the unquestioned and comfortable feelings that move through us, like anger, victimhood, envy, greed ect..To choose compassion we have to be more self-aware, we have to actually “choose” this virtue and practice it, in order to really live a life that is aligned with that. As there is something goes against the grain or something about compassion as it seems to run against the backbone of the egos need to feel special and superior. That by loving our enemy we are being passive and inactive. We are also taught from very young age what we are allowed to like and dislike. We are taught to feel shame when we are sexual, aggressive, weak or emotional and a whole myriad normal human emotions get expel into our shadow. So to face that which is ugly in ourselves and others with love, kindness and understanding is radical act. So with this in mind I don’t have to deny my anger or conceal my selfishness and greed, rather by the very act of acknowledging it I dispossess it of the power that comes from its denial. I can accept I have these aspects of who I am and I can consciously choose to live from the more honest and loving part of who I am. In doing so I also allow myself to accept that ugliness in others and choose compassion over anger and resentment in how I relate. I am not getting it right all the time, I may write something inflammatory and hostile but as a compass point, it is something I can keep coming back to. As to choose compassion doesn’t answer the entire world’s problem, it doesn’t provide a neat blueprint as to how things are going to change. Yet what it does do is it puts us personally and collectively in a space for a genuine revolution to arise. As loving what we are not, we discover that what we are not, is what in fact we are. That we are all connected and joined to larger whole and to each other. That what we do to others, we really do unto ourselves. So no matter how far I may stray, the virtue of compassion is something can keep coming back to, as you can never have too much compassion. I believe Media Lens did the right thing. Inciting any kind of violence, even tongue-in-cheek satirical violence, towards anyone, especially people in very public positions of power is not wise at the best of times. You’ve just got to chalk this one up to experience. What intrigues me, though, is the hypocrisy of the Media Lens editors. Time and time again, despite numerous pleadings and complaints from members of the Message Board (many of whom have since left), ML continues to publish comments, posts and links from Message Board members that incite hatred and truly vile ridicule of women, and brand feminists as troublemakers, extremists, whores and, witches. I used to comment there in the past, until the overt outpourings of misogyny, and the editors’ smarmy justifications for giving them a voice on the grounds of ‘freedom of opinion/speech/whatever’, became too much to bear. Thanks for your feedback Marian.I don’t agree with it being deleted as i think its obvious that its humour, and it only would incite laughter, if anything.That said, i respect their position and ultimately its there message board and they take responsibility for what does and doesn’t go up. I also used it to reflect and consider that maybe there was something I missed that I should look at. Regarding posting that ridicule women I haven’t read any of those myself and there is a consensus of the group that if you do challenge in someway , it does seem to come down hard on whoever that is. I guess i have just never been on the receiving end of that. I still enjoying go on there posting my articles , as well everyday there always great links to the most recent stories and news.So I just take it as a great resource and try not let it get to personal.